Following a tradition begun with The Force Awakens and continued with Rogue One, Lucasfilm and its licensees used a Friday in September to mark the official launch for The Last Jedi tie-in merchandise, including action figures and toys, collectibles and plushes, and a wide variety of other products from bedroom dressing to Philips cordless razors. 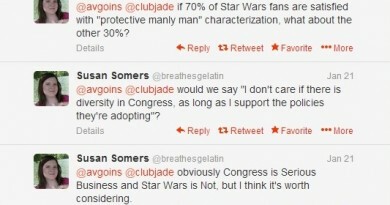 Unsurprisingly the number of midnight events nationwide was down compared to 2015, now that the promotion is recurring rather than the end of a decade-long movie hiatus, but social media nonetheless was active with fans celebrating their first opportunity to purchase highly anticipated Episode VIII additions like porgs, Rose, and Jedi Training Rey. This year, FANgirl had the chance to experience Force Friday at Disneyland. The center of Disneyland’s Force Friday was the World of Disney store in Downtown Disney. To manage crowd control for the event, Disney used a wristband process. Fans registered for wristbands online beginning at 11:00 a.m. PDT on August 24. Check-in to receive a wristband and place-in-line number started at 6:00 p.m. on August 31 in one of the small ballrooms in the Grand Californian hotel. The card with the line number also included a return time to queue up in the large ballroom across the hall, allowing Disney to stagger the influx and outflow of people from the waiting room. With a number in the first 100 our return time was 11:00 p.m., and the gathered throng in the waiting room indicated that fans were respecting the staggered timetable. Water was available to drink, and cast members distributed double-sided flyers with lists of the Parks exclusive merchandise that would be available in the store. One standee for the Find the Force augmented reality feature in the Star Wars app stood along one wall, but because the app was time-locked to midnight, the first groups of wristbanded fans were unable to experience the AR features in the waiting room. After lining up in numerical order, the queue moved outside to the sidewalk in front of World of Disney, where taped-off rows designated the Force Friday waiting area. Fans chatted in line while waiting to be admitted to the store. 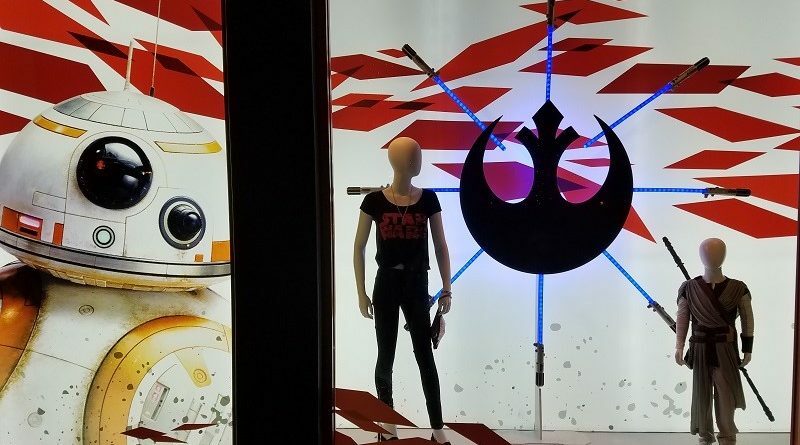 Shortly before midnight the previously draped store windows were unveiled, revealing The Last Jedi themed displays and some of the new merchandise. The line began to move on time and excitement buzzed among the crowd as fans drew closer to the entrance, where two rows of cast members with lightsabers welcomed fans inside. Within the World of Disney store, cast members did an admirable job of keeping the acquisition and purchase process as smooth and efficient as possible. All of the Force Friday merchandise had been set out in the front half of one sales floor in the store, so the aisles among the fixed display racks were noticeably more crowded than normal. Aside from that claustrophobic milieu, though, it was easy to get what you wanted. Different types of merchandise were arranged in separate areas, allowing the action figure seekers and pin traders to stay out of each other’s way, for example. 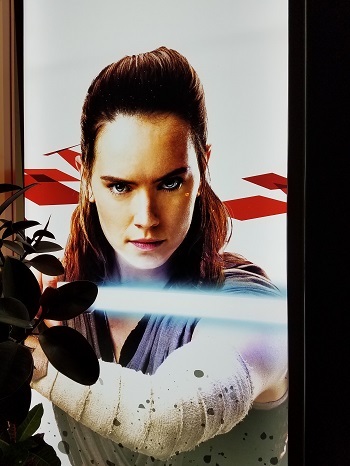 Cast members also did not try to maintain the pretense of restocking empty shelves; for high demand items such as the Parks exclusive Rey lightsaber and the six-inch Black Series action figures, cast members simply passed them out straight from the case to fans who sought them. Plenty of stock had been ordered for the event, and during our time in the store only the Rey lightsaber was not immediately available. Unlike some previous events at Star Wars Weekends or Star Wars Celebration, World of Disney had plenty of cashiers on duty. Once we were done shopping, we had essentially no wait to checkout and, despite being almost number 100 in line, were finished and out of the store before 1:00 a.m. had chimed on the clock. World of Disney also offered the full slate of Find the Force standees to unlock AR characters in the Star Wars app. That was much appreciated, avoiding the need to visit any other stores on Force Friday to unlock the full set. 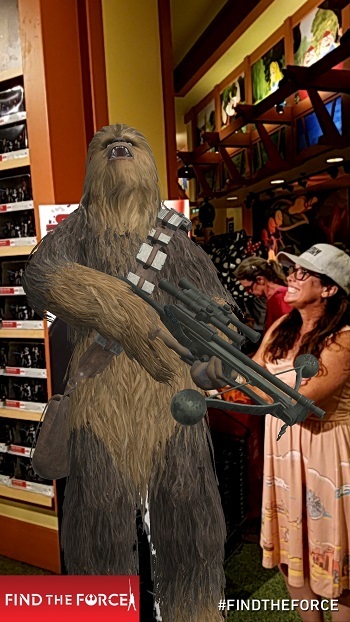 Posing in pictures with the AR characters proved something of a challenge because the standees were located among the merchandise displays, and in the crowded environment it was often unavoidable that another fan would inadvertently pass between the camera and the standee, breaking the AR connection. That difficulty was primarily due to the high volume of customers for the midnight event, however, while the standees naturally had been set up for use by the ordinary crowds during regular business hours. By the time we left World of Disney, we’d purchased the items we’d wanted and unlocked a new set of AR characters in the app – quite a success. Groups of cast members cheered the attendees as they left the store, which closed the store visit with an extra dose of Disney magic. 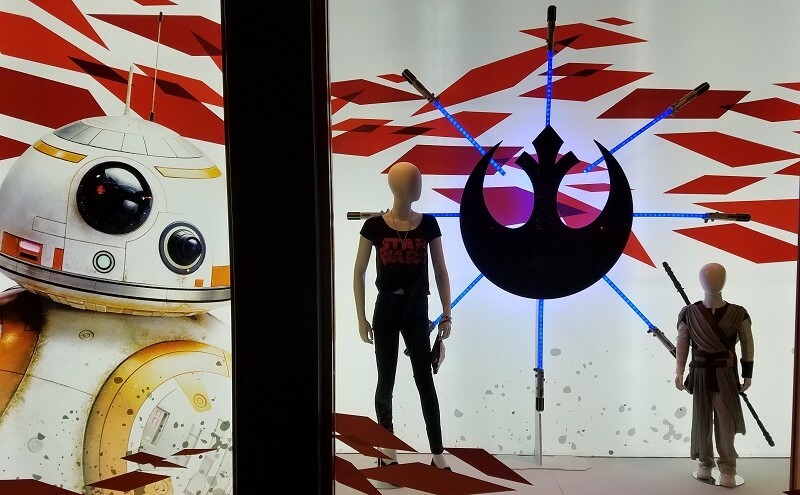 With the Force Friday midnight event serving as the kickoff, The Last Jedi merchandise became available in Disneyland’s stores, too. 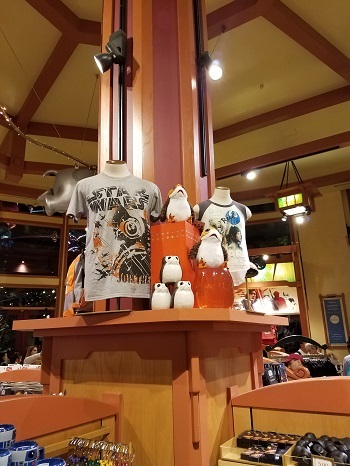 When we visited Star Trader and Launch Bay on Saturday, for example, whole sections of the sales floor had been restocked with The Last Jedi and other new items, from action figure and porg plushes to shirts and hats. Toys that reportedly were hard to find in many retail outlets, such as Black Series versions of Jedi Master Luke and Jedi Training Rey, were plentiful in the park. Between Star Trader and Launch Bay we located a full set of Find the Force AR standees, as well. 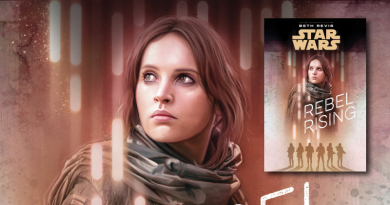 The D-Tech customized on-demand phone cases in Launch Bay also received a Force Friday update with brand new artwork from The Last Jedi, adding an unexpected but welcome purchase to the haul. We returned to World of Disney on Saturday evening to assess its availability of Force Friday merchandise, and found it still fully stocked. The Parks exclusive Rey lightsaber was available on the shelves again, and quantities of Black Series and 3.75″ action figures had been replenished. After nearly two full business days of further customers, World of Disney did not appear to have any shortages of supply, something that social media made clear could not be said of many other stores around the country. With the Find the Force standees still available, we would have been able to unlock any remaining of Saturday’s AR characters, had we not already completed that quest inside the park. Overall, Force Friday weekend at Disneyland was impressively run both in its logistical operation and its merchandise supply. Cast members and management should be commended for their preparation and execution of a high-demand event in a location populated with numerous passionate Star Wars fans. 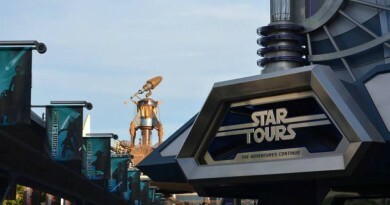 Whether Anaheim or Orlando, we certainly would prioritize a Disney Parks Force Friday event over other retail establishments for Episode IX’s Force Friday and beyond.